That figure comes courtesy of a Global Download Report published by the global game-delivery company Pando Networks. The study, which was conducted from January 1 through June 30th, 2011, tracked the download speeds of 21 million gamers around the world. Most of the gamers Pando works with are in the MMO/Free-To-Play realm, playing games like League of Legends and Lord of the Rings Online. Salient findings are listed in a handy infographic at the end of this post, including the fact that the United States doesn't even crack the top 15 fastest countries in the world (though way to go Andover, Mass., for being one of only two of the top twelve fastest cities not located in South Korea)! Verizon is our fastest internet provider, followed by Comcast. AT&T is quite a ways down the list. Virgin Media rules Great Britain, and Dacom Corp is king in South Korea. 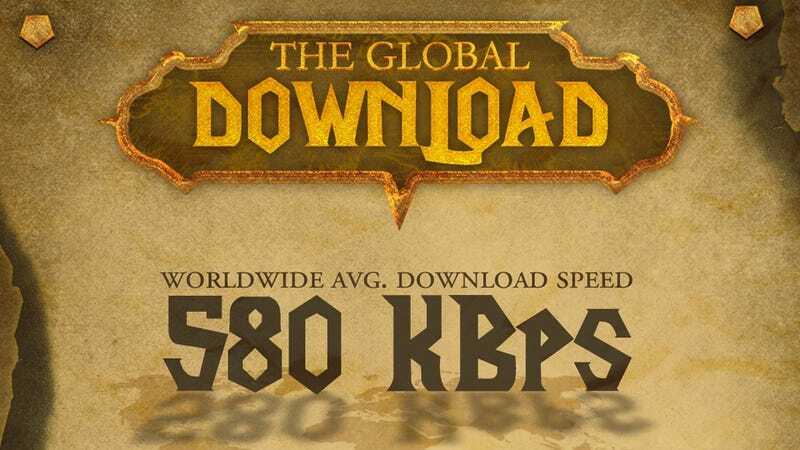 South Korea's sixth-fastest download service is almost three times faster than the United States' fastest. Dang. I should note that Pando sent these numbers with no third-party corroboration; we're taking them at their word on the soundness of the study and its findings. A representative from Pando told me that the users on their network might be a touch faster than average due to their high use of peer-to-peer file sharing. The infographic below breaks the whole study down (larger version here).